What is Predator DR 2x2 Hardware? Predator DR 2x2 Hardware provides 2 Serial ports and 2 Ethernet ports per machine in a din rail package. 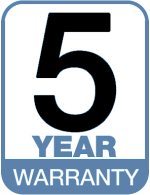 Designed for manufacturers with reliable Ethernet infrastructure. 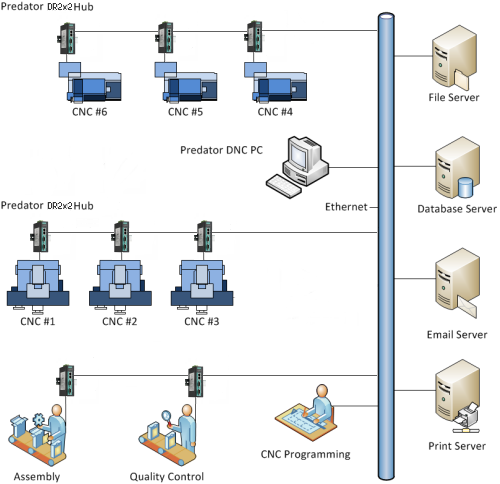 Network up to 1024 CNCs, robots and PLCs to your Windows based PC. Predator DR 2x2 Hardware supports transfers of your CNC programs, offsets and parameters. It supports a wide range of CNC protocols for dripfeeding, downloading, and uploading via RS-232. Why use Predator DR 2x2 hubs? NOTE*: Requires Predator DR 2x2 hubs and Predator DNC. How many Flex/N hubs can be installed in one PC? Up to 256 hubs can be installed in the same PC. Can Express and Flex/N hardware be installed on the same PC? Yes. Both hardware platforms can be co-mingled.